The Aerospace (AE) Day at Sugar Valley Airport was a great success. The event was hosted by the newly formed Sugar Valley Composite Squadron in Davie Co. The CAP squadron has the complete support of the private airport owner. A number of privately owned Aircraft are based there. The location is beautiful. It has a large lake beside the paved runway and a camping area with a fire pit and picnic tables. 1st Lt. Lee Kosub of the host Squadron stated that the Squadron Public Affairs Officer , S/M Deborah Leighton photographed the event. Every Cadet launched a Titian and then a two-stage Saturn. 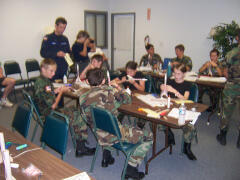 All completed their hands-on requirement for the Rocket Program. The third launch was a riot. It was free style and the cadets could choose their engines A, B, Or C .Most chose the C6-5 engines that were available. The Titians kept going out of site with the Cadets standing in awe and squealing with glee. Several rockets were lost. This was a fun time for cadets and seniors alike. C/1st Lt Robert N. Abruzzino attends four activities in one summer. This past summer C/1st Lt Robert N. Abruzzino of the Iredell Composite Squadron served as flight commander at the 2013 Summer Encampment and attended the Regional Honor Guard Academy, the Hawk Mountain Ranger School and Blue Beret. This past weekend, having already earned his model rocketry badge, he assisted at the Sugar Valley airport AE Day. Truly a dedicated cadet, he is seen here wearing his hard earned blue beret at the far left of the photo taken at Sugar Valley airport. The AE staff expressed sincere thanks to the Squadron Commander, Major Eric Orgain and his Staff members that put in a lot of work providing this a great event.